School is just a few weeks away here in New York. 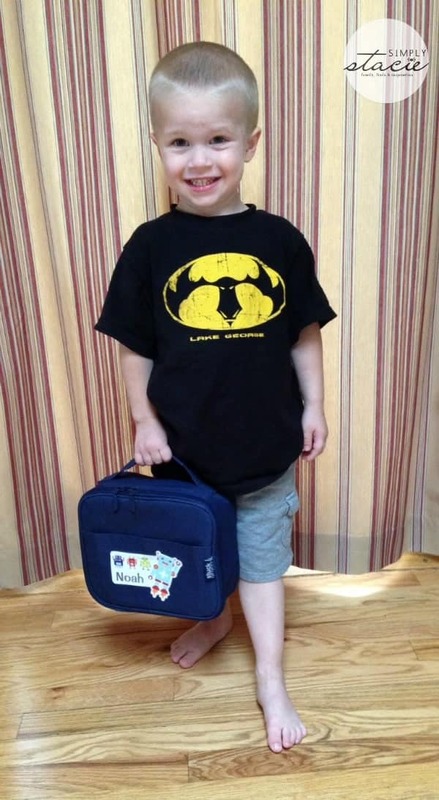 My oldest son Matthew is all set for entering kindergarten this fall. My little guy, Noah, is starting preschool and he has been very excited to be a part of the “getting ready for school” process this year. Having seen his older brother leave the house for preschool the past two years, he’s excited that it’s finally his turn! Having gone through the preschool process with Matthew, and working a few days during the week at the school myself, I know that the most important thing to do with everything that Noah takes with him to preschool has to be labelled. So many kids come and go and it’s so easy for everything from backpacks to water bottles to get misplaced and lost forever. I’ve labelled all of Matthew’s items for kindergarten with the Stuck On You labels we received for review earlier in the summer. I find the labels to be sturdy, they stick well, and they’ve held up quite nicely through the summer. 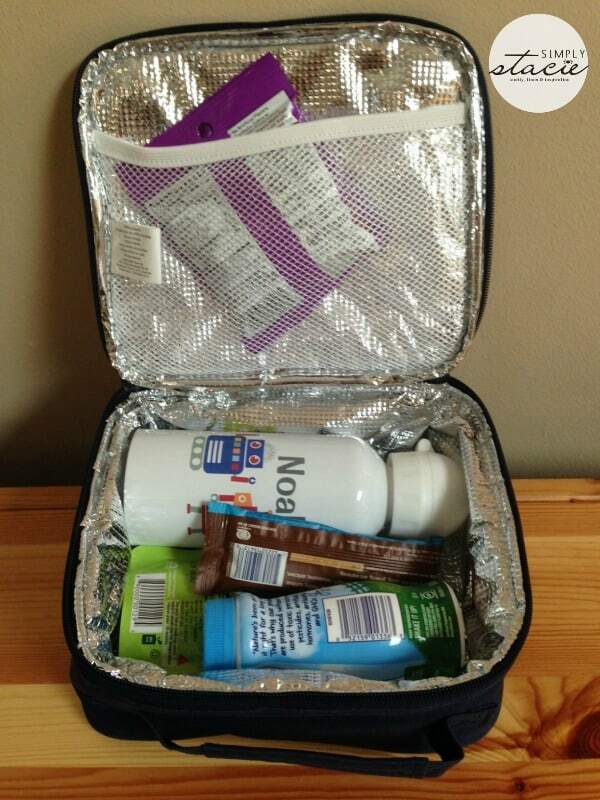 Noah won’t need to bring labelled supplies to preschool, but he will need to bring a lunchbox everyday for snack time, so the Lunch Pack value pack from Stuck On You was the perfect fit for this review! 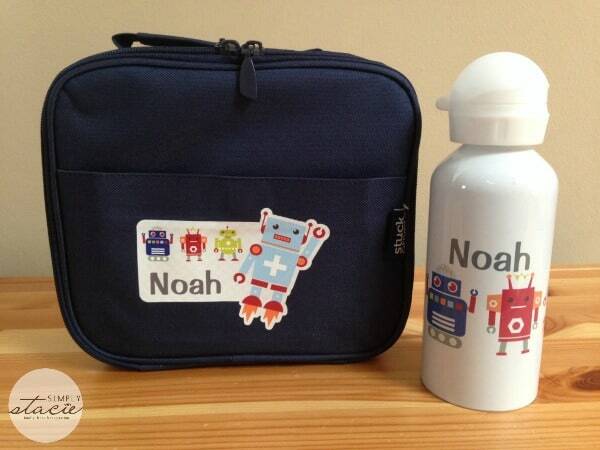 The Lunch Pack value pack includes a personalized lunchbox and water bottle. I chose the navy color and the retro robot design for Noah. Personalizing your Lunch Pack is easy – simply click on the color, the design and the font you want, fill in the name to be used and click preview. 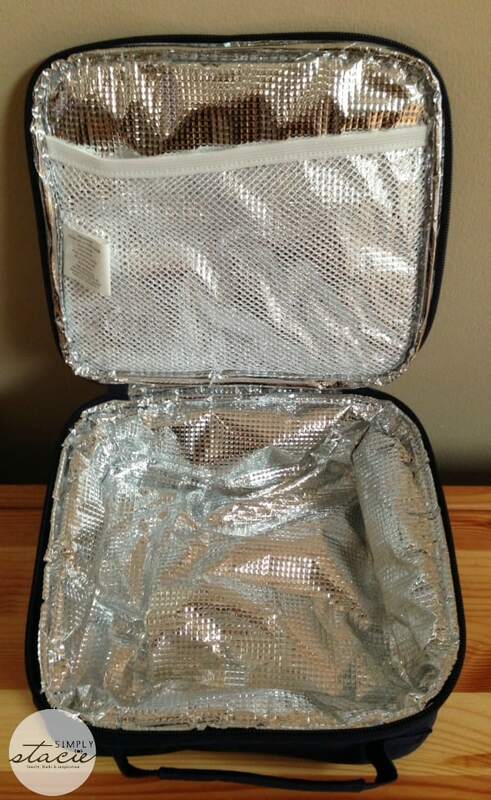 I love the design of this lunchbox. It’s made from durable poly canvas, is fully lined and can be cleaned easily with a damp cloth (and the liner means any spills will be contained in the lunchbox and not all over your car/backpack!). The water bottle is stainless steel, BPA-free, and has an easy to use pop up lid with a plastic spill proof cap. I like that this bottle was designed with little hands in mind – at three, Noah was easily able to open this bottle himself. With his name prominent on both items, I’m certain that these will come home with him every day! The quality of both of these items means that Noah will be able to use them for many school years to come. The Lunch Pack value pack retails for $49.95 on the Stuck On You site. Stuck on You was created in 1995 by a mom in her backyard, for her son who needed labels for daycare. Now, over 18 years later, Stuck on You offers a huge range of personalized labels and gifts and sells to hundreds of countries over the world. Whether you need labels for school supplies, tags for luggage, backpacks for travel, or you’re just looking for cute personalized gift ideas, Stuck On You has you covered. You can see all that they have to offer on their website. You can also find them on Facebook, Twitter, Google+, YouTube and Pinterest. I love the Personalised Wooden Name Puzzles.